*In this example we used pages from an old calendar – but it works best with photos! I spread a thin layer of glue all over the back of the photo, then lined up the craft sticks over the photo, leaving a small gap between each one. I made two puzzles, and used different colour sticks for each one, so that it was easy to separate out the two puzzles if the sticks got mixed up. When the glue was dry I used a craft knife to cut between each craft stick. F really loved playing with them! You can see in the polar picture that some of the red dye from the sticks has transferred to the image – but this wouldn’t happen if you were using thicker photo paper. 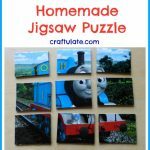 These photo puzzles would be super easy to personalize and give as gifts – and perfect for sending in the mail! Although I made these by myself, older children could definitely help make them too. At the very least they can choose which photo to use!